Joe started playing for the Ogs in 1994 in both football and hurling at Under 16 level, league and championship. 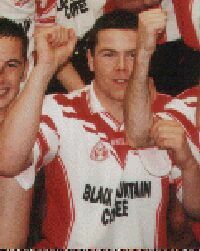 Joe then played minor football from 1996 to 1998, before moving up to senior and South Antrim football. Joe’s most memorable moments so far for the Ogs, were winning the Martin Cup in 2005 and Junior Football Championship win in 2001. "Angry" Joe's lowest moment has been getting beaten by Larne in senior hurling. Joe recalls his funniest moment as driving around Glasgow in a taxi with Barry Hall and Anto Donnelly with Barry constantly shouting at the driver “Take us to dirty women”, before being dropped off in some council estate. Cheers Baz!